Which Harbeth is right for you? Thanks for sharing. I really enjoy the pictures. they are awesome! You were asking P3ESR setup picture and I hope to see it too....Your question reminded me your setup picture is not here or I over look? Hope to see your setup photos here as well. any P3ESR setup picture for us to savour in? New pictures of the system with the Rega Elicit. Very nice sounding amplifier that matches the SHL5 very well. Maybe it has been asked before, but what stands are those in the picture? 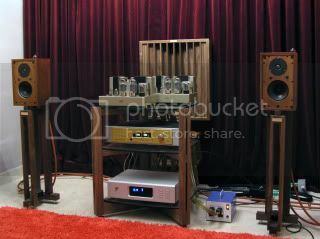 The stands are specialy made by Malaysia dealer sold together with his Harbeth speakers. Lovely pics but are they hoping the speakers will grow to fit the stands ????? What is the veneer on the special edition? Walnut? Rose Walnut? this is my humble setup; P3ESR driven by Leben CS300. the P3ESR is a better match to the Leben tube amp. P3ESR produce great results in pop, percussion, vocal music. Nice setup. You no longer use the Lavardin? All times are GMT. This page was generated at 03:34 AM.